Some of you may be thinking this is the weirdest post you've ever seen in your life, but it's something I wanted to talk about here on my blog as I feel it's a topic which is sensitive for many people. For years and years. I spent every day worrying about the tiniest spot on my face, or even if I just had a mark on my face; it bothered me. I know I personally wear concealer because I know it covers my spots, or at least makes them look a bit less visible than what they are without concealer on. Let's be honest, if I have a spot, it's going to be as red and as a big as a tomato, but on my chin or cheek; always. This is no exaggeration either. So obviously many of you know that I work with children and around a month ago I was sat on a bench with a bunch of girls who I work with. We also all know children are very innocent and tell you everything that they see or hear. This girl, who is a wonderful girl I have to say said "You have spots". Clearly pointing out the obvious and telling me something I already knew. I didn't get angry and this comment didn't phase me because well, everyone has spots. So I said to her "I know I do, and one day when you're older, you're going to have spots too and I'm sure your sister has spots, and I know your mum has had spots and this is something we all have to grow up with." And honestly, she seemed really shocked, sort of thinking "really? I don't want to have spots" and then her friend says to her "I'm six and I have a spot". From this moment I sort of let go of the fact I have spots. I stopped letting it bother me. I used to go to my boyfriend's house, take off my makeup and say "sorry, I'm having a bad skin day and I have loads of spots" but I don't anymore. I've accepted the fact that a week before my period, I have spots; it happens. If I'm stressed, I have spots. But I'm not the only person in this world that has them, yet we all tried to hide them like they're something to be ashamed of. Why do we spend so much time worrying about something which is so natural? Something which absolutely everyone has to put up with. Men have spots, young boys have spots and they can't cover them the way us girls do. Yet we cover them because usually the case is, we're worried about what other people are going to say about our skin. But who gives a monkey? It's our skin, it's our body, and spots do not change us as a person, and they do not make us "ugly". So why is there this big stigma about them? 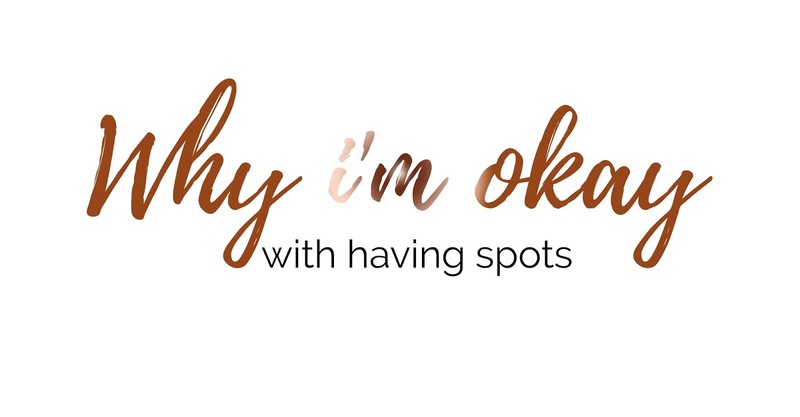 We should be showing children that it's okay to have spots when you grow up, not showing them that we have to hide them every time we get them. How do you feel about having spots? Do you hide them or embrace them? I love this! I have struggled with spots for so long and i too am comming to temrs with them and just embracing them!